Chinese scholar’s stones, variously called “viewing stones,” “spirit stones,” “respect stones, (gongshi),” and even “weird rocks (guaishi),” have been appreciated and written about in China for more than a millennium. And although acquiring them in the West has become increasingly popular in recent times, most people perceive this hobby as limited to wealthy collectors. This need not be so: appreciating and collecting scholar’s stones is popular among people of all means and occupations in China, and should be in the West as well. The continuing popularity of these wonderful objects has in fact meant that many more exciting stone types have become available, and at much more modest prices. All the would-be collector needs is a good eye and the basic information about stone types and characteristics that this book provides. 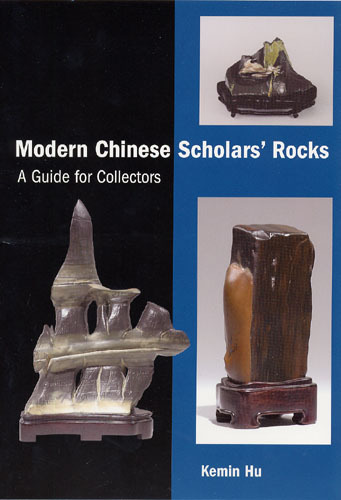 Through descriptions and color photographs, Modern Chinese Scholars’ Rocks introduces over fifty stone types, including their mineral compositions, typical colors, hardness on the Mohr scale, and where they are found or quarried. The qualities for which they are valued are explained, as are other features for the stone connoisseur to look for. Separate chapters explain how to display stones to their best advantage and how display stands are chosen or made. This modest, straightforward, and informative volume will engage readers in the exciting world of appreciating and collecting these natural art objects. Kemin Hu’s passionate interest in scholars’ stones came from her father, Hu Zhao-kang, a noted connoisseur of Chinese antiquities. Kemin’s own vast collection of scholar’s rocks has been featured in several exhibitions, including at the Staten Island Botanical Garden, and she has been interviewed on Chinese television about her collecting career. She has lectured widely on the subject and is the author of Spirit of Gongshi: Chinese Scholars’ Rocks and Scholars Rocks in Ancient China: The Suyuan Stone Catalogue.